For other uses, see Scoria (disambiguation). Scoria differs from pumice, another vesicular volcanic rock, in having larger vesicles and thicker vesicle walls, and hence is denser. The difference is probably the result of lower magma viscosity, allowing rapid volatile diffusion, bubble growth, coalescence, and bursting. As rising magma encounters lower pressures, dissolved gases are able to exsolve and form vesicles. Some of the vesicles are trapped when the magma chills and solidifies. Vesicles are usually small, spheroidal and do not impinge upon one another; instead they open into one another with little distortion. Volcanic cones of scoria can be left behind after eruptions, usually forming mountains with a crater at the summit. An example is Maungarei in New Zealand, which like Te Tatua-a-Riukiuta in the south of the same city has been extensively quarried. Quincan, a unique form of Scoria, is quarried at Mount Quincan in Far North Queensland, Australia. Scoria has several useful characteristics that influence how it is used. It is somewhat porous, has high surface area and strength for its weight, and often has striking colours. Scoria is often used in landscaping and drainage works. It is also commonly used in gas barbecue grills. Scoria can be used for high-temperature insulation. Scoria is used on oil well sites to limit mud issues with heavy truck traffic. 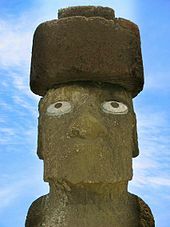 The quarry of Puna Pau on Rapa Nui/Easter Island was the source of a red-coloured scoria which the Rapanui people used to carve the pukao (or topknots) for their distinctive moai statues, and to carve some moai from. It is also used as a traction aid on ice- and snow-covered roads. Fresh scoria sometimes has a blue sheen to its surface. Scoria of various hues exists on Mount Tarawera, from its 1886 eruption. Photomicrograph of a volcanic lithic fragment (sand grain) derived from scoria; upper picture is plane-polarized light, bottom picture is cross-polarized light, scale box at left-center is 0.25 millimeter. Red scoria cliffs at Akyia-kaigan coast in the Oki Islands, Japan. It was erupted 2.8 million years ago. Scoriaceous boulder near Point Mugu, California. ^ Three Kings Quarry, Winstone Aggregates.